Blackcomb is a high yielding new variety that has high levels of resistance to foliar diseases - mildew, White Pine Blister Rust - , vigorous growth habit and tolerance to late spring frost. Blackcomb has produced yields in replicated B.C. trials that were more than 50% higher than Titania and Ben Alder. Fruit size is 20% larger than Titania. Flowering is late mid-season and this variety has demonstrated better tolerance to late spring frost than Titania. Well suited to machine harvest. Recommended for trial in Canada and northern U.S. states. I can attest to the yield potential of Whistler. In our best treatment under plastic, without irrigation or supplemental fertilization we yielded 11lbs per plant in the plant's fifth year after planting and following a year where the plants were completely pruned down to 20cm above ground. I also really like the flavour or Whistler and Blackcomb. Whistler has high yields of small to medium sized high quality fruit. It has fair resistance to mildew and good resistance to White Pine Blister Rust. Growth habit is slightly spreading with medium vigor. Flowering is late-mid season with good tolerance for late spring frost. Yields in replicated B.C. trials were more than 50% higher than Titania and Ben Alder. Fruit size is smaller than Ben Alder, .8 grams per berry. Juice quality is excellent. Well suited to machine harvest. Whistler had yields second only to one of our numbered varieties and the largest fruit size in Montana State University field trials. Also, was rated as the best variety in a study by a graduate student at Dalhousie University in Nova Scotia, Canada with high yield and large fruit. In most areas Whistler would be suited to hand harvest as well as machine harvest applications. "We purchased 900 whistler plugs in 2010 and another 2200 plugs in 2012. The plants arrived in excellent shape, packaged neatly in waxed cardboard boxes. Their survival rate was fantastic at >99%. They have grown vigorously and are hardy. We just went through one of the coldest winters on record, and didn't lose a plant. No sign of blister rust or other significant disease/pest problems as far as we can tell. 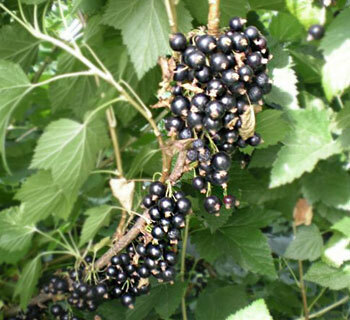 The fruit is large and has the classic black currant piney pungency. The flavor is what we love the most - an intense sweet-tart berry flavor that makes wonderful jam and fantastic wine!" Tahsis scored the highest yields in replicated trials in coastal British Columbia. Flowers late mid-season, tolerant of late frost, has high levels of resistance to White Pine Blister Rust, resistant to mildew, and has very large fruit (larger than Ben Sarek). Growth habit is spreading which makes it suitable for hand harvest or U-pick, displays the fruit well, but not suitable for machine harvest. Annual pruning is a must. Tahsis had yields right behind Whistler and large fruit in Montana State University field trials. 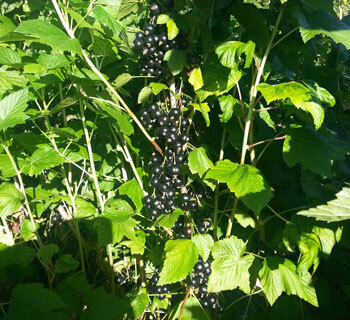 "The Tahsis black currants have caused many of our east European customers to express their amazement at the size and flavor. 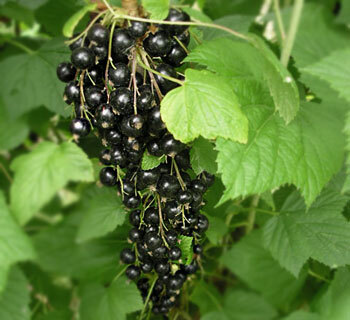 Black currants are a big deal, for they are considered a strong medical aid for good health, and the Tahsis seem to be current champions of good health. It amuses me to see repeat customers arrive each new picking season, and like school children ask, if the, " Big berries," have been picked yet, or if they are the first." New release from the McGinnis Berry Crops Limited breeding program. Stikine's main features are incredible flavor profile, high levels of resistance to White Pine Blister Rust and other foliar diseases, very high yields and suitability to both hand harvest and machine harvest. One potential drawback is its short hang time. Stikine is best processed into juice or offered to fresh market customers. The resulting flavor profile is much better suited to North American consumer preferences.